TORONTO - Canada’s economy faces some tough challenges as exports are further affected by a prolonged global slowdown and domestic demand weakens, the Conference Board of Canada says. Despite the cautious sentiment, Board economist Paul Darby says Canada will avoid a recession. He told the Conference Board’s annual business outlook briefing on Wednesday that economic growth will be weak in many areas but he expects overall gross domestic product will be up next year. WASHINGTON–The threat of cybersecurity attacks are on the rise from organized crime, terrorists, and foreign governments, an FBI official warned on Wednesday. There are a “couple dozen” countries interested in breaching U.S. networks, said Shawn Henry, assistant director of the FBI cyber division, though he declined to list any specific countries. The attempted attacks on U.S. networks are “increasingly sophisticated” and “the amount of information that has been stolen is significant,” Henry said. On the eve of a potentially ground-shifting U.S. election, liberal filmmaker and gadfly Michael Moore is in Canada making a moving about that country’s political system. That’s according to a blogger with the conservative Web site, Pajamas Media, who happened upon Moore and his crew filming a candidates debate in a “riding” — what Americans call an electoral district — of Sault Ste. Marie, Ontario. The blogger, Pete Vere, writes: “Moore and his camera crew came across as camera shy when I attempted to interview them on the record.” Moore is typically close-mouthed about his projects to give him the element of surprise with his intended subjects. “Finally, Moore’s camera man, a tall, clean-shaven fellow with bushy brown hair who identified himself as John Walter, revealed the big secret: Moore was taping a new movie contrasting Canada’s political system with that of his home and native land,” Vere writes. The Bush administration issued a pair of secret memos to the CIA in 2003 and 2004 that explicitly endorsed the agency’s use of interrogation techniques such as waterboarding against al-Qaeda suspects — documents prompted by worries among intelligence officials about a possible backlash if details of the program became public. The classified memos, which have not been previously disclosed, were requested by then-CIA Director George J. Tenet more than a year after the start of the secret interrogations, according to four administration and intelligence officials familiar with the documents. Although Justice Department lawyers, beginning in 2002, had signed off on the agency’s interrogation methods, senior CIA officials were troubled that White House policymakers had never endorsed the program in writing. OTTAWA — Stephen Harper’s Conservatives won a muscular minority mandate Tuesday night as Canadian voters entrusted the prime minister with the levers of government in tough economic times — but not a blank cheque. The outcome saw the Liberals sink to they’re lowest level of popular support since the election of 1867 — and surely means a third change of leadership in five years for what was long dubbed Canada’s natural governing party. The Conservatives were headed for 143 seats, up from 124 in the last election, while the Liberals were down to 77 from 103. The NDP was up by nine seats to 38 and the Bloc Quebecois shed two seats to 48. Two Independents also won. If Harper is expecting an easy ride in 2009, the economy may dictate otherwise. It has been revealed that the head of John McCain’s transition team aided an influence effort on behalf of Saddam Hussein to ease international sanctions against Iraq in the 1990s. The latest revelation about McCain staffer William Timmons is sure to cause panic among members of the struggling McCain campaign team, who will have to work overtime doing damage control. Vets to March on NY Debate? Genetic pollution could last longer than nuclear waste and global warming, said Jeffrey Smith, author of “Seeds of Deception,” Monday night at The Forum at UW-Eau Claire’s Zorn Arena. It would be impossible to recall genetically modified mosquitoes or salmon once they’re released into nature. Much of the foods we eat - such as soy, corn and canola oil - have been genetically modified to withstand herbicides and pesticides, creating new organisms that never existed before. And they might be causing major health risks, Smith said. “They put genes from bacteria and viruses into crops,” Smith said. 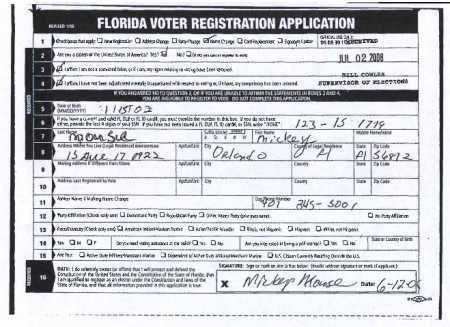 Mickey Mouse tried to register to vote in Florida this summer. Orange County elections officials rejected his application, which was stamped with the logo of the nonprofit group ACORN. Tow truck driver Newton Bell did register to vote in Orange County this summer. In the hands of ACORN, his paperwork went through without a hitch. Two cases, two outcomes, each with a connection to ACORN, the Association of Community Organizations for Reform Now. Prosecution of BushCo War Criminals Dean Velvel THANK YOU! The Olympics are not about the human spirit & have little to do with athletic excellence; they are a multi-billion dollar industry backed by powerful elites, real estate, construction, hotel, tourism and television corporations, working hand in hand with their partners in crime: government officials & members of the International Olympic Committee (IOC).